Every spring, the town of Niagara-on-the-Lake in Ontario, Canada comes to life in an array of color from the hundreds of flowering tulips which line the streets. As the sun shines in the town of Niagara-on-the-Lake, the tulips open up their flower heads into a cup shape until the evening light settles in and then they close up until first light at morning. Niagara-on-the-Lake is one of the prettiest towns in Ontario where visitors can step back in time and stroll the historic sites. 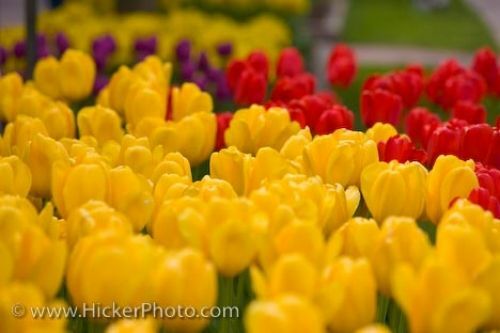 Fine dining, shopping, wineries and farm markets are just a short list of the things to see and do while being surrounded by the spring time tulips. Picture of the beautiful flowering tulips along the sides of the street in Niagara-on-the-Lake in Ontario, Canada.